Lenovo introduced its new mid-range model, the Moto G5, at the Mobile World Congress 2017. As a global bestseller, this smartphone aims to symbolize a break with the Motorola era in favor of Lenovo, with a more premium feel than its predecessor. So, is this fifth generation Moto G smartphone worth its while? Read on to find out in our full review. The amount of RAM and internal memory available on Lenovo devices is generally very market dependent. With this G5, Lenovo has opted for an internal memory of 16 GB and 2 GB of RAM, all for a price of $260. The smartphone has been available for purchase since the end of March in two color variants: gray and gold. At first glance, we notice that Lenovo has adapted the design of the smartphone to incorporate that of its top range. This rings especially true when looking at the back of the device where we find the typical round camera module as seen on the Moto Z Play and Moto Z. Whether we like this or not, at least it doesn’t stick out, like on some other Lenovo products. As a result, the Moto G5 is perfectly flat at the rear. The main difference with its predecessor is the size of the device. The Moto G5 is more compact because its screen is no longer 5.5 but rather 5 inches. According to a study by Lenovo, people do not seek large displays as much as one might have thought. The device is therefore very pleasant to hold, and despite its relative thickness and its slightly rugged appearance, you barely notice it once it’s in your pocket. Holding it, it’s honestly hard to tell whether it’s made of metal or plastic. In actual fact, it seems that the rear part is made of aluminum while the edges are plastic. This may be because the battery is removable. The other novelty on this G5 is the fingerprint scanner, which until now was reserved for the Plus version of Moto G. This scanner is located at the front of the device and is integrated within a button that also acts as a navigation key (more on this further down). 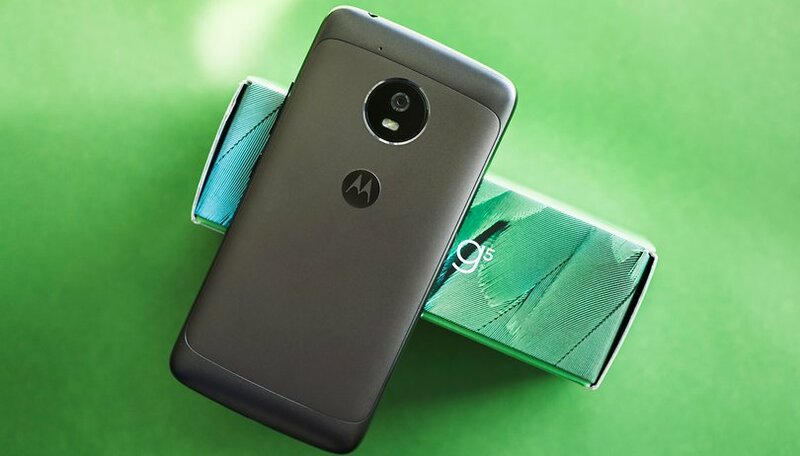 Although aesthetically the Moto G5 is quite a classic smartphone, its finish is very well done and the Moto G5 leave you an overall impression of solidity. Ultimately, the only downside to this Moto G5 is on the front of the device, next to the home button: there is a microphone that seems to have been a little neglected. It’s a pity that Lenovo didn't fill this hole, it would have looked considerably prettier than the gaping hole it now has. In general, Lenovo did a good job on the Moto G5. The smartphone doesn’t have a massive wow factor, but it puts forward a classic device at a decent price, with a proper finish and nice ergonomic design. The Moto G5 features a Full-HD 5-inch IPS LCD screen. This is one of the biggest pros of this smartphone. The device is bright and surpasses almost all its competitors in the same price range. The readability of the screen is excellent even in sunny outdoor conditions (provided the screen brightness is increased, of course). All the details are clearly displayed and the colors are relatively bright. The screen can sometimes look slightly bluish, but it’s not disastrous. In terms of contrast, the Moto G5 also does quite well. It should be noted that from the display options, you can change the brightness and color temperature according to your own preferences. Two modes are available: "Standard" or "Vibrant" colors. In all honesty though, the difference between the two settings is not very obvious. There is also Ambient Display, which allows certain information to be displayed (like the time or notifications) at a simple gesture, like taking the phone out of the pocket. The software of the Moto G5 is almost identical to stock Android. Regarding the system version, Lenovo opted for Android 7.0, denying the latest version available. However, the G5 should receive the next Android O version very soon, like the Moto G4 did with Nougat. Motorola simply adds its Moto app to the pure Android version, which allows the home button to be customized with gestures and other features (shake for a screenshot, sweep to reduce the screen, slice to illuminate, etc.). Like the Huawei P10, the home button, which includes a fingerprint scanner, also offers another way to navigate. You can use it instead of the navigation keys. Slide to the right or left to see recent tasks, click to lock the device, slide right or left to go back. On Android 7.0 Nougat, the screen can also be divided in two by drawing a line with your finger across the screen. In addition to several software features, the Moto G5 is compatible with the Google Assistant. What else is new is that the Moto G5 and the G5 Plus will also work with Amazon Echo’s Alexa. Google currently already offers its smart wizard to other manufacturers and older smartphones, which is why the arrival of Alexa on this smartphone is quite unexpected. Will it be better than Google’s wizard? More good news for this software interface is that there is no bloatware, unlike many of its competitors. Since only 16 GB of storage is available (only 9.5 GB of which is accessible), this was a wise decision on behalf of Lenovo. This lack of internal memory is one of the aspects that I find the most regrettable on this phone. Although the memory can be expanded with a microSD card, I find it a shame that Lenovo hasn’t made the effort to put more internal memory there in the first place. Its starting price of $260 certainly explains this decision and the Moto G5 Plus is available for users wanting 32 GB. As for the processor, Lenovo uses a Snapdragon 430 processor. At first glance, one might think that Lenovo is going backwards but the performance of the 430 is quite similar to the Snapdragon 617 chip used in the Moto G4. The latter had won us over for everyday use, and the same goes this year for the Snapdragon 430. Unlike the Moto G5 Plus, there is only 2 GB of RAM but in practice, the smartphone functions perfectly fluidly and is pleasant to use. You’ll only reach the phone’s limit if you abuse the multi-tasking or if you play games that are very resource-intensive, like Need for Speed. The limitations of the smartphone can be seen in the benchmark test results, but on a daily basis, once again, the Moto G5 will not disappoint. The Moto G5 is reliable and fast, and it highlights the progress entry-level and mid-range smartphones have undergone in recent years. It performs a little less well than some of its competitors like the Honor 6X but it’s also a bit more affordable. The sound quality of the Moto G5 is decent. The mono loudspeaker is sufficient for most multimedia uses (gaming, video playback, etc.). Of course, the sound quality is far from perfect but it’s still surprisingly good. If you turn the volume up high, the sound becomes slightly sharp and is quite strident. Lenovo could have paid a little more attention to this but we must accept some setbacks on a $260 smartphone, like the lack of stereo sound. The audio output is very good with virtually no distortion. If you use a Bluetooth headset, you’ll also have no issues. It pairs easily and the sound doesn’t shift. In terms of call quality, I didn’t come across any problems. I had no trouble being understood during my calls or hearing the person on the other end, even in a crowded place like the subway during rush hour. The Moto G5 has a 13 MP camera. Lenovo left out a dual pixel sensor but it still has phase detection autofocus. The camera app is minimalist and only offers a few options. Those who’ve already had a Moto or a Nexus smartphone will be most familiar with the app. As for the photo quality, for a smartphone of its range, the Moto G5 is pleasantly surprising, provided the surroundings are bright. There is a good contrast, decent sharpness and a satisfactory level of detail. I also have no complaints with regards to the reproduction of colors. On the other hand, in low light conditions, the Moto G5 leaves a lot to be desired, even with the flash. There is a lot of noise, it’s difficult to focus and the final quality is disappointing. The front camera is satisfactory for its role and is sufficient for selfies. In general, the picture-taking procedure is normal. Sometimes you have to be patient in HDR mode. To save time, you can disable this. Lenovo also offers a "Pro" mode, which is quite comprehensive for those who want to take it a step further by setting certain options, such as ISO, white balance, etc. For video, you can shoot in Full-HD at 60 frames per second and slow-motion in HD at 120 frames per second. However, the sensor suffers from the same problems in low light. At the time of its launch, Lenovo promised us good autonomy with its 2,800 mAh battery. Under usual but sustained use (a few calls, texting, WhatsApp, YouTube...), the battery will hold out for more than a day. Under fairly moderate use, it can hold out for up to two full days. These good results are thanks to its low-power processor and the good software optimization of the device. In the PCMark battery test, the Moto G5 held its own for 10 hours and 35 minutes, going from 100 percent to 20 percent. For the sake of comparison, the recently-announced Honor 8 Pro scored 8 hours and 16 minutes. Now here’s a piece of news that will please many: the battery is removable. The Turbo Power quick-charging system also gives you several hours of battery life in a few minutes. How much, you ask? Well, I was able to charge half the battery in half an hour. For this latest phone in the Moto G series, not much has changed really. This minor technical evolution is not necessarily a mistake on the part of Lenovo, because the device has nevertheless evolved intelligently. The Moto G5 is simply a more modern version of its predecessor. In terms of design, Lenovo has certainly made some changes in size (a smaller screen and a transition to metal), but overall, it’s not the design that will win you over for this speedy device. This doesn’t prevent the Moto G5 from simply being a device with potentially the best value for money on the market at the moment. For $260, you can get a compact smartphone that’s nice to hold, with a very good screen and offering the purest Android experience available. You could call it a kind of entry level Nexus or Pixel phone if you want. Add a fingerprint scanner, decent battery life and photo capabilities that are far from ridiculous and you’ve got a VERY good affordable smartphone in 2017. I am worried about the fluency in such a low configuration. May have been interested in the G5 Plus if they had kept the 5.5" screen but after having a G4 Plus for the past few months not interested in going down on screen size.. I've been setting up a G5+ for my daughter and checking for warranty issues. It's a very good phone as designed. Gets better reception than any other phone I've used in my problematic location. Screen is good though the default font is huge. Turn that down in the settings as well. The bezels are very large. I prefer a larger screen but I think that's what the X will get to differentiate it. Motorola's skin is very light as always. They opt you in by default for their data collection so check that in the settings if you want to change it. Performance is quite good in app switching. I've not had lagging yet for my uses. Gaming struggled some but that's to be expected. Most of my phone gaming is casual and it's fine for that. The boot up sound is awful. Turn that OFF in the settings. Boot time is a bit slower than I expected. No NFC, no magnetometer. I like both of those features for my uses but that's not a big deal at this price point. Looks promising. It all depends upon the market and pricing.